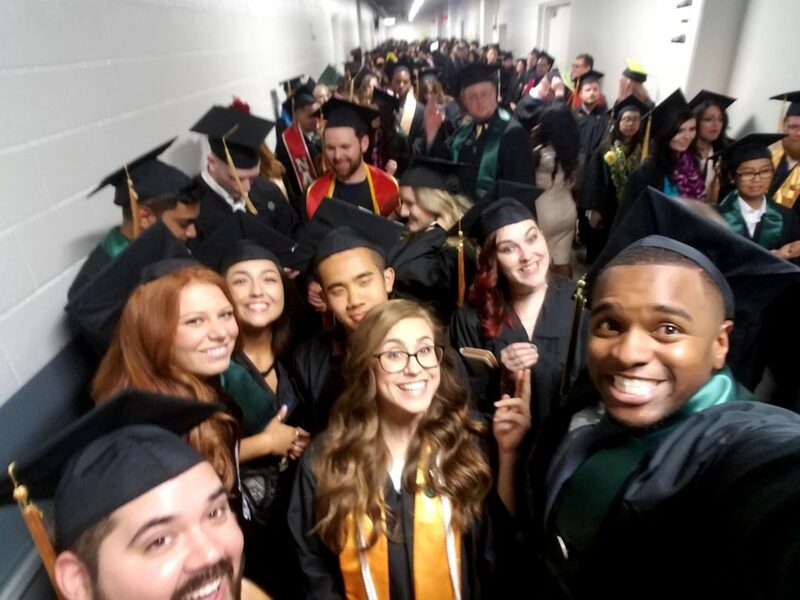 That time I invited my class to negotiate the syllabus – Shawna Malvini Redden, Ph.D.
And then I admitted to my senior seminar students, on the first day of class, that I was running something of an experiment with them. We were going to negotiate the syllabus together. And I’d never done it before. But it would be fun! I hoped. Most looked incredulous. Many looked nervous. Some wanted a rationale. I explained how I’d read an article over the break about using syllabus negotiation as a way to make a collaborative contract between professors and students (see Kaplan & Renard, 2015), and share power/ownership in the class. And how I’d been looking for a way to simulate more “real life” organizational experiences in class. And that I’d talked to a colleague who ran syllabus negotiations regularly, and how it was a meaningful experience for his classes (thank you again Josh Barbour!!). The main hopes? That having students actively participate in designing the structure of the class would generate buy-in, ownership, commitment, and ultimately better, more fun learning. I began by outlining the things that could not change, per university policy, such as our class time/date/location and the necessity for grading. Then I shared my commitments–active participation, specific learning goals, professionalism, and distraction free class sessions (read: no freaking electronics). Then I let them have at it. Students were initially skeptical when I said everything was up for debate. And to be frank, that was the most terrifying thing. In our conversations, Josh warned that this activity might not be the best idea if I couldn’t be open to change and the possibility that the syllabus I so carefully designed could be radically altered. It’s hard enough to design a class, let alone face the potential for having to re-design it with the semester in full swing. But I’d already committed to the process and I reiterated that everything was on the table. I asked students to read the syllabus and make some notes about their priorities for the class. Then I asked them to get into small groups, share, discuss and compile lists. We generated ideas for how we wanted our classroom environment to feel (in addition to the norms of civility I outlined already). Among other things, the students added: Respect first amendment rights/allow for different opinions, allow others to finish speaking/no interrupting, if you need help, ask for it, and hands on activities/no dry movies. Then I asked students to hone in on two categories of changes, those focused on class policies and class assignments. The negotiation process started on the first day for a few minutes, and continued for most of two full class periods. While many complained (later, in reflection assignments) about it taking “forever” and being tedious, the activity showed how deliberation takes time and patience, especially if the goal is for everyone to be comfortable, which was one of the parameters. We all had to agree to the changes and everyone had the ability to veto. If the negotiating was a complete bust, we could always go back to the original syllabus. During the actual negotiation process, I compiled a list of each group’s ideas which was projected for everyone to see. We got all of the ideas down and then figured out what we agreed on, what we would never agree on, etc. For instance, everyone concurred that mandatory group work was for the birds, and that a solo option should be allowed. But the class was completely split on punctuality. Many agreed with me that being on time is important, but others pined for a 10 minute grace period on my collecting papers at the beginning of class policy. After talking at length, the punctuality policy ruled. Between discussions, I shared notes and revised syllabi with changes circled in bright red. We discussed concerns and voted section by section until we got through to the end. The result? One of the most fun and engaged classes I’ve ever had. When I said “our class” throughout the semester, it really felt that way. Students took ownership of the activities and material in a way I haven’t seen before. It was so cool! And I got the joy of saying several times “Well, that was your choice” (like when students complained at the end of the semester about the weekly homework assignments). 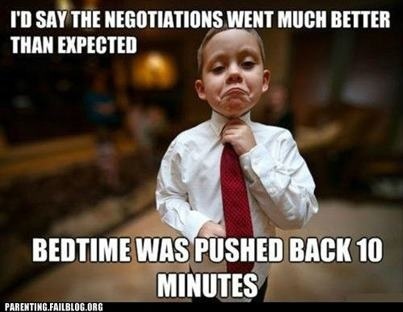 Even better, the negotiation served as a case study for evaluating many organizational processes during the semester. I asked students to immediately reflect on the experience, and then midway through the term to conduct an analysis of power and influence, and later, a discussion of leadership and decision making. The negotiation, which carried through the semester when we figured out the midterm and final projects together, set a collaborative tone that was a bit magical. The experience culminated in one of the best final exam potlucks ever, where Mario brought street tacos (complete with griddle to warm tortillas), Kib shared graduation lumpia, and Lauren, Karen and Liz hefted in a what seemed like 10-pound Claim Jumper chocolate cake. (With so many more delicacies I don’t have room to name.) 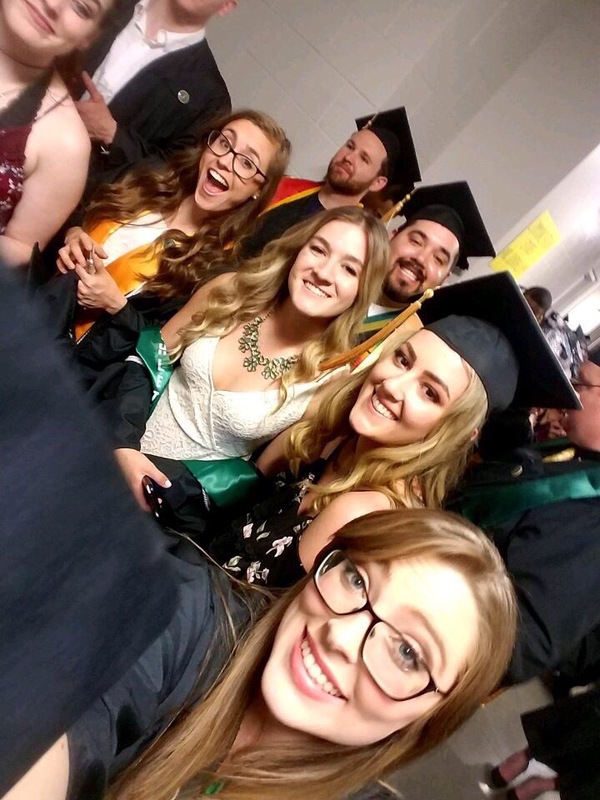 I almost cried when I saw most of the class sitting together at graduation, and maybe I’m a little teary now remembering all of the hugs and exclamations of joy from commencement. Le sigh. In hindsight, I wouldn’t change much about the process. One student suggestion was to start negotiations a little ways into the semester after students had a chance to get to know each other. But given the constraints on time (and my admitted discomfort with ongoing uncertainty with schedules), I would probably budget one extra class and spend the first full day on team building exercises. Other than that, I thought the jumping right in thing served as a pretty good ice breaker in and of itself. All in all, a fantastic social and pedagogical experiment that I look forward to trying again next semester! P/S For those who might consider a negotiation, I will say that I’d taught the class for several years first and it was a small-ish (25 student) senior seminar course with high expectations for leadership and engagement. I probably wouldn’t consider a full negotiation with say a freshman level class or a large lecture. Sometimes I teach two senior seminars in the same semester, and I’d be hesitant to negotiate both just for my own sanity of keeping the classes straight. But we’ll see!